Azerbaijani movies "Red Garden" and "Icherisheher" continues their dazzling success abroad. Recently, the national films have been screened at the 4th Silk Road Film Festival in China. Both movies were shot by "Azerbaijanfilm" studio by the order of the Ministry of Culture and Tourism. The feature film was screened at Kazakhstan’s 12th Eurasia, Germany’s 65th Mannheim-Heidelberg, Egypt’s 38th Cairo, Turkey’s 5th “Van Lake” and Bulgaria’s 9th “Sofia MENAR” international film festivals. Founded in 2012, the Silk Road International Film Festival (SRIFF) is fast becoming an international acclaimed film festival which is held annually during the month of March in Dublin, Ireland. The festival also holds year-round screenings, talks & events. Cast includes Magsud Mammadov, Gulzar Gurbanova, and Taleh Badiyev. The film was co-produced by AzerbaijanFilm Company and White Media, (Russia). "Icherisheher" by Ilgar Safat tells a love story of a young girl and a Karabakh war veteran. The lead roles are performed by Tahmina Rafaella, Firdovsi Atakishiyev, Mehriban Zeki and Elmira Shabanova. The psychological drama was directed by Tahmina Rafaella, screenwriters are Tahmina Rafaella and Ilgar Safat. The film shooting took place in Baku and Zagatala regions of Azerbaijan. The feature film has been produced by J.Jabbarli 'Azerbayjanfilm' studio under the order of the Culture and Tourism Ministry. "Icherisheher" has been screened at film festivals in a number of countries, including Egypt, India and Estonia. Founded in 2012, the Silk Road International Film Festival (SRIFF) is fast becoming an international acclaimed film festival which is held annually during the month of March in Dublin, Ireland. The festival also holds year-round screenings, talks and events. 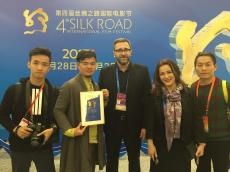 SRIFF aspires to continue the Silk Road cultural heritage, which in its heyday sustained a multicultural collaboration that strung together diverse groups.